Welcome to Cam Lilies – the home of Australian garden lilies. Our focus is on hardy garden lilies, but we also grow a range of species liliums. Cam Lilies is a small grower of Lilium bulbs based at Camdale in North-west Tasmania. 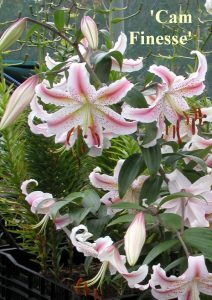 Most of our lines are bred here by Neil Jordan, or sometimes selected, registered and named by us from lilies grown from seed from other growers around the globe. Liliums are deciduous by nature. This means that they die down after flowering, drawing their nutrients back into the bulb ready to produce fresh new growth in late spring. Lifting bulbs is only possible after they have become dormant. Hence we load all available bulbs onto our Online Shop early in June of each year. We are unable to supply bulbs at other times of the year.